Everyone needs a catharsis. An outlet for pent-up energy, frustration and negative emotions. Some people drink, some eat, and others find more constructive ways to let off steam. I’m lucky enough to have two excellent catharsises (catharses? catharsisis? 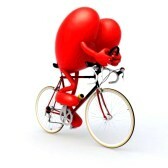 you get the idea): Exercise and writing. No matter what’s going on or where I am, I almost always find a way to get in a daily workout. When at home, I can lift weights or play basketball at the local Y, go for a bike ride, work in the yard, or plod away on our basement treadmill. While on the road, I can either go for a jog (a great way to see the local sites!) or use a hotel fitness center. When staying at hole-in-the-wall hotels, I bring along my jump rope and work out right in the room. Regardless of what’s going on in my life, that workout helps me clear my head and see things in a proper perspective. The writing part is interesting. To be honest, I’m not much of a reader (aside from the sports page of the newspaper). But I love to write. It allows me to focus and block out everything else that might be going on. And believe me, when I’m trying to manage my own diabetes while assisting hundreds of clients at a time to manage theirs, I need time away from looking at numbers and charts! Writing also lets me be as creative as I like. Things at work can sometimes become repetitive and mundane, but writing gives me an opportunity to explore, express, and satirize to my heart’s content. Over the years, I’ve written more articles for diabetes consumer and trade magazines than I can count. Lately, much of the article writing has been for web-based publications such as Diatribe and InsulinNation. But books are a whole other story (literally). While articles are focused on a singular topic, books can cover a wide range of concepts in considerable depth. Talk about an opportunity to immerse myself! My first book, You Can Control Diabetes, was something I co-authored with a delightful and passionate physician named Dr. Abdul Ghani back in 1997. It was a general overview of type-1 and type-2 diabetes care, with the goal of putting the patient more in charge of their own management. My second book (published in 2004), Think Like A Pancreas, is what helped put me on the map from a professional standpoint. It covered the ins and outs of setting up and fine-tuning an intensive insulin program. 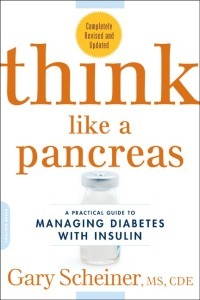 The second edition of Think Like a Pancreas, which came out in 2011, has sold more than 25,000 copies and has been named a “must read” by several reviewers for both people with diabetes and healthcare providers. In 2006, I wrote The Ultimate Guide to Accurate Carb Counting. This was meant to serve as a teaching guide for those needing to master their carb counting skills – something I’ve found to be critical for those who take mealtime insulin. 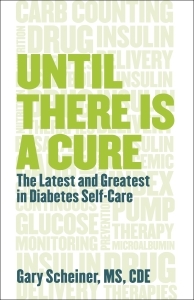 In 2010, I got off my beaten path a bit and wrote a book that focuses more on type-2 diabetes self-management called Get Control of Your Blood Sugar. No, I did not choose the title. In 2011 I had an opportunity to do a complete copy-edit and revision of a popular consumer title, The Diabetic Bible. Now that’s a title I can sink my teeth into! BTW, my latest little cathartic project involves a new book on continuous glucose monitoring, to be published by the American Diabetes Association in 2015. If you use a Continuous Glucose Monitor or prescribe one, it will help you to get better functionality from the system and be able to interpret the data in both real-time and retrospectively. Watch for it next summer. So that’s my cathartic story. Say… just writing about it has made me feel better. 2 diabetes and low magnesium levels who were taking the medication glibenclamide. Myth: Diabetics are more susceptible to the common cold and other diseases than others.